Statcounter provides customisable hit counters, visitor tracking, web analytics and website stats for Zenfolio. Log-in to your Zenfolio account (opens in a new window) with your username and password. Select "StatCounter" from available options. 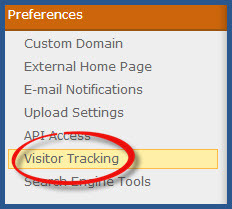 Select "Enable Visitor Tracking with StatCounter. Enter your StatCounter code and "Save". You should receive a message: "Your changes were saved successfully". Select "Save". Note: In some instances our code check cannot "see" the code properly and you may see the below message in your StatCounter account. the best way to determine if your code is active is to hav a few friends checkout your site and then check your StatCounter account to see if their visits appear in your stats. However, if you have any questions or doubts regarding your code installation please contact us so that we may check the code for you. StatCounter is now active on your Zenfolio site and will immediately begin recording visitor information. Sign up for a Statcounter account using our Zenfolio installation guide. You can reinstall Zenfolio on your Statcounter project.